Eranthis cilicica (above & below) is the first aconite to flower for me, it comes from the Cilician Taurus Mountains in S Turkey which is probably why it does much better for me than Eranthis hyemalis. The leaves are tinged with a bronze colour and are more dissected than E. hyemalis. We need to raise all Eranthis from seed, as I do not think any Nursery is selling Eranthis in Australia. Eranthis when grown from seed acclimatises much better for us, because it has been raised in our climate, which can be difficult at the best of times. Seed needs to be kept moist during germination, when seed arrives from seed exchanges soak in a drop of detergent and luke warm water, the luke warm water helps dissolve the detergent, soak overnight. Sow seed in a good potting mix with leaf mulch mixed through it, cover seed with a good layer of fine gravel 1/4 minus is best. When seed germinates do not pot up for 2 to 3 years just leave it in its pot, feed with a granular fertiliser as soon as it germinates and transplant when it has leaves, so that you can distinguish the tiny brown bulbs, that look for all the world like a dark piece of tan bark, in the potting mix. Place pots out in the rain away from slugs and snails, in a cool shady position and cross your fingers. 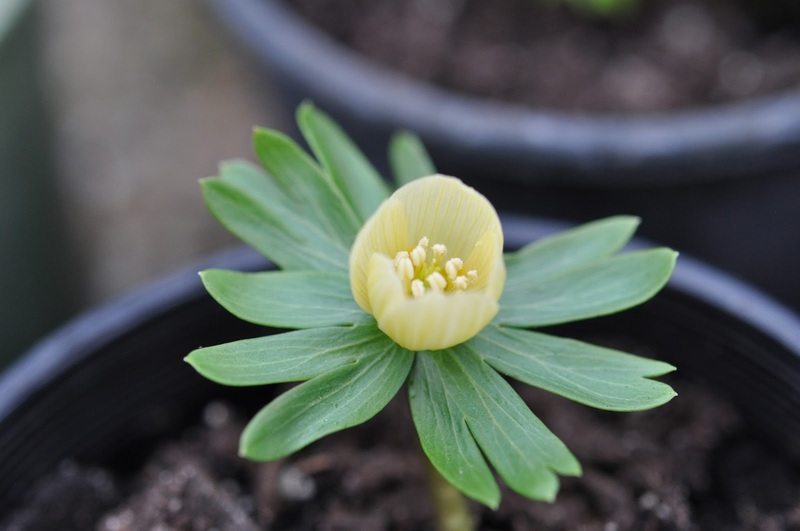 Eranthis hyemalis Pauline from Winton seed United kingdom, a hybrid Eranthis a light straw yellow coloured flower (above) comes through the ground very pale and gradually changes colour. 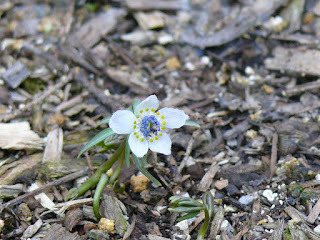 Eranthis hyemalis Pauline above and below. 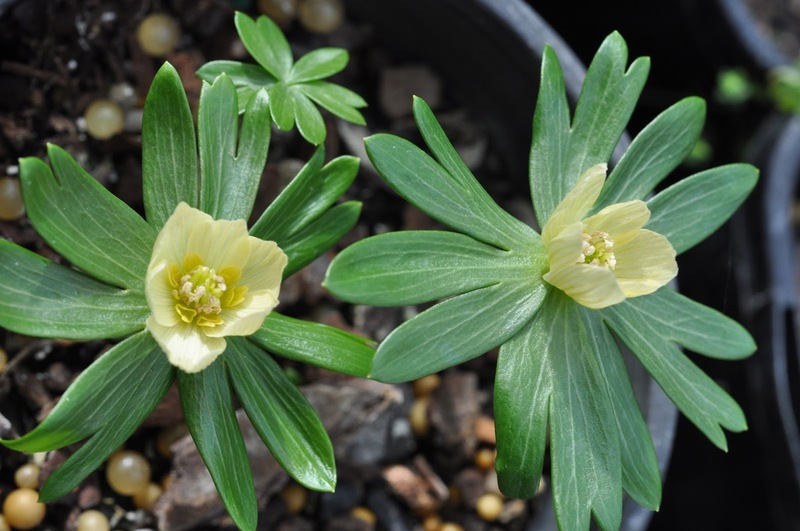 Eranthis hyemalis Schwefelglanze (below) is another very pale coloured Eranthis, although saying that, my son Aarons is much darker so there is variation in flower colour when raising from seed. Eranthis hyemalis Schwefelglanze is often offered on the SRGC and the AGS seed exchanges so it is available. Eranthis hyemalis from the European woodlands and is found growing extensively in large gardens under deciduous trees in the UK along with snowdrops causing quite a sensation. Eranthis sp. (below) from New Zealand seed exchange I think it is E. hyemalis, I struggle with E. hyemalis in the garden here I'm not sure why, but it does so much better for me in pots, so I will just keep saving my seed and multiply my stocks until I have enough to plant out in the garden, sow your own seed as soon as it is ripe and it will germinate the very next year. You wouldn't want to be in a hurry with this seed raising business would you, it requires hugh patience. Eranthis pinnatifida (below) photographed in Lynn Mc Goughs garden in Olinda. A native of Japan in mountain woods, it needs a moist position in a peaty soil. 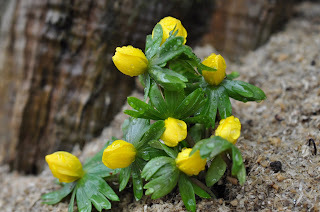 The flowers are about 2cm wide so the flowers are smaller than other Eranthis. I have never seen the seed of Eranthis pinnatifida offered on seed exchanges. Sometimes a nursery in Japan www.yuzawa-engei.net has Eranthis pinnatifida for sale, they do sell moist packeted seed if you request it. There is a very good Article in the SRG E magazine. International Rock Gardener and you can see what they are able to grow and buy over there.